After a ground ball struck 2B Umpire Joe West's foot in shallow center field, Cubs batter Willson Contreras took advantage, hustling into second base with a double as the Padres fielders recovered during Tuesday's game in San Diego. With two out and none on, Contreras grounded a base hit up the middle and onto the outfield grass, where the ball bounced into Joe West as he began his run toward the infield, the added delay of Padre retrieval allowing Contreras to achieve second base ahead of the throw. Score it an umpire-assisted double. 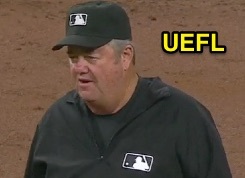 Cowboy Joe West plays soccer at Petco Park. 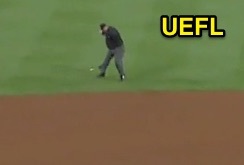 As previously discussed in Umpire Interference, Rule 5.06(c)(6) [or 5.09(f) under old-format OBR] states that a batted ball becomes dead when, "A fair ball touches a runner or an umpire on fair territory before it touches an infielder including the pitcher, or touches an umpire before it has passed an infielder other than the pitcher; runners advance, if forced." In regard to remedial action for this scenario, 5.06(c) continues, "The ball becomes dead and runners advance one base, or return to their bases, without liability to be put out." 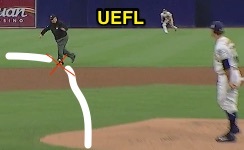 Diagram of the play, which is past the infield. Although rare, a batted ball that has already passed the entire infielder staff, only to then touch an umpire, is a live ball. This is what occurred Tuesday in San Diego, as B1 Contreras' batted fair ball bounded past at least one Padres infielder (for the sake of technicality, it was the shortstop) before touching Cowboy Joe in shallow center field, meaning that West and his crew properly kept the ball alive and in play. Earlier this month, we explored the case of a batted ball striking a second base umpire who works inside, or on the infield grass. In that play, a batted ball deflected off the pitcher before bouncing off the second base umpire and rolling to the shortstop, who stepped on second base and threw to first for a double play. That, too, was properly officiated, as the batted ball first touched a defensive player (the pitcher) before touching an umpire. Had the ball merely passed the pitcher without him touching it, however, only to then strike the inside umpire, the proper call would be dead ball, and a one base award to the batter and any forced runners, since the pitcher is not considered a full-fledged infielder specifically for the purpose of Rule 5.06(c)(6).